ONE STEP TROPONIN I TEST IS AN IMMUNOCHROMATOGRAPHY BASED ONE STEP IN VITRO TEST. 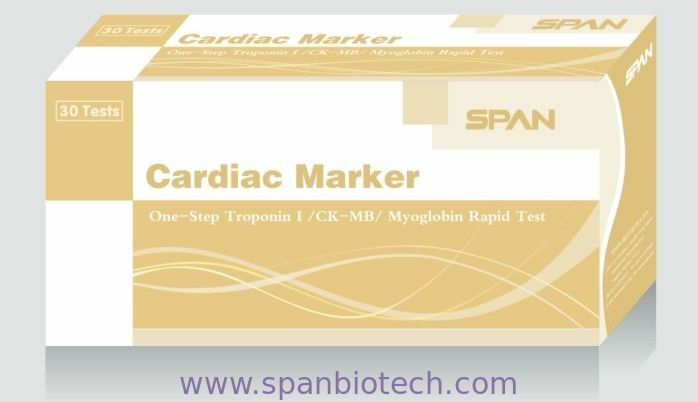 IT IS DESIGNED FOR QUALITATIVE DETERMINATION OF CARDIAC TROPONIN I (CTNL) IN HUMAN WHOLE BLOOD, SERUM OR PLASMA AS AN AID IN THE DIAGNOSIS OF MYOCARDIAL INFARCTION. Cardiac Troponin I (cTnI) is a cardiac muscle protein with a molecular weight of 22.5 kilodaltons. Together with troponin T (TnT) and troponin C (TnC), TnI forms a troponin complex in heart to play a fundamental role in the transmission of intracellular calcium signal actin-myosin interaction. Although troponin I is also found in skeletal muscle, cardiac troponin I (cTnI) has an additional amino acid residues on its N-terminal which distinguishes it from its skeletal muscle form making cTnI a specific marker for indicating cardiac infarction. cTnI is released rapidly into blood stream soon after the onset of acute myocardial infarction (AMI). Its release pattern is similar to CK-MB (4-6 hours after the onset of AMI). However, CK-MB level returns to normal after 36-48 hours, when levels of cTnI remains elevated for up to 6-10 days. The level of cTnI is below 0.06ng/ml in average in healthy people, and also not detected in the patients with skeletal muscle injury. Therefore, cTnI is a specific marker for diagnosis of AMI patients. The level of cTnI may reach 100-1300ng/ml in some AMI patients. The One-Step Troponin I Test is a chromatographic immunoassay for the qualitative determination of cTnI in human whole blood, serum or plasma. When specimen is added to sample pad, it moves through the conjugate pad and mobilizes gold anti-cTnI conjugate that is coated on the conjugate pad. The mixture moves along the membrane by capillary action and reacts with anti-cTnI antibody that is coated on the test region. If cTnI is present, the result is the formation of a colored band in the test region. If there is no cTnI in the sample the area will remain colorless. The sample continues to move to the control area and forms a pink color, indicating the test is working and the result is valid. 2. The test device must remain in the sealed pouch until use. 4. Do not use beyond the expiration date. 1. For professional and IN VITRO diagnostic use only. 2. The test device should remain in the sealed pouch until use. Do not use after the expiration date. 3. All serum or plasma specimens should be considered potentially hazardous and handled in the same manner as an infectious agent. 4. The test device should be discarded in a proper biohazard container after testing. 5. Avoid cross-contamination of serum samples by changing a new specimen pipette for each sample. 1. Testing should be performed immediately after the specimens have been collected. Do not leave the specimens at room temperature for prolonged periods. Specimens may be stored at 2-8°C for up to 3 days. For long-term storage, specimens should be kept below -20°C. 2. Bring specimens to room temperature prior to testing. Frozen specimens must be completely thawed and mixed well prior to testing. Specimens should not be frozen and thawed repeatedly. 1. Read package insert carefully before testing. Allow the test devices, whole blood, serum or plasma to equilibrate to room temperature (15-30°C) prior to testing. Do not open pouches until ready to perform the assay. 2. Remove the test device from the foil pouch and use it as soon as possible. 3. Place the test device on a clean and level surface. Hold the dropper provided vertically and transfer 3 drops of specimen (100µl) to the specimen well (S) in the test device. 4. Wait for the red line(s) to appear. The result should be read between 10 to 15 minutes. 1. Positive Two colored lines should be observed in the viewing window. The line in the test region (T) is the probe line; the line in the control region (C) is the control line, which is used to indicate proper performance of the device. The color intensity of the test line may be weaker or stronger than that of the control line. 2. Negative The control line appears in the test window, but the test line is not visible. 3. Invalid No line appears in the control region. Under no circumstances should a positive sample be identified until the control line forms in the viewing area. If the control line does not form, the test result is inconclusive and the assay should be repeated. 1. The test result should be used in conjunction with other clinical information such as clinical signs/symptoms and other test results to diagnose AMI. A negative result obtained from a patient whose sample was taken at 2-16 hours after the onset of chest pain may help in ruling out AMI.A positive result from a patient suspected of AMI may be used as a rule-in diagnosis and requires further confirmation. Serial sampling of patients suspected of AMI is also recommended due to the delay between the onset of symptoms and the release of the cTnI into the blood stream. 2. The Troponin I test only provides qualitative result. A quantitative method must be used to determine the cTnI concentration. 3. As with all diagnostic tests, a definitive clinical diagnosis should not be based on the result of a single test, but should only be made by the physician after all clinical and laboratory findings have been evaluated. The One-Step Troponin I Test designed to yield a positive result for cTnI concentrations at 0.5 ng/ml or greater. The time required for blood cTnI level to reach the upper limit of normal has been found to be 4-6 hours after the onset of symptoms. CTnI level reaches the maximum concentration after 12-24 hours of the onset, and then remains elevated for 6-10 days in some cases. Therefore, a negative result within the first hours of the onset of symptoms does not rule out AMI with certainty. If suspected, repeat the test at appropriate intervals.